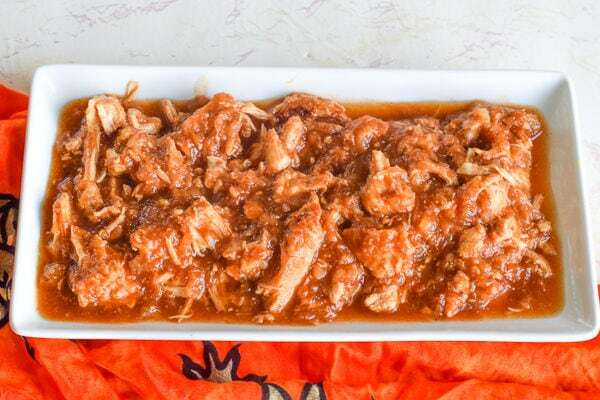 Make this sweet and satisfying instant pot Hawaiian chicken with less than 10 minutes of prep time. This is an easy 3 ingredient recipe that you can just mix together and walk away. We have been making Hawaiian chicken for years in our slow cooker. It was always one of my go-to recipes for busy nights. Well, I don’t use my slow cooker much these days. I do still use it, but my go-to for quick and easy dinners is now my instant pot. I hopped on facebook live a few weeks ago and shared how I was just winging it and throwing together dinner. 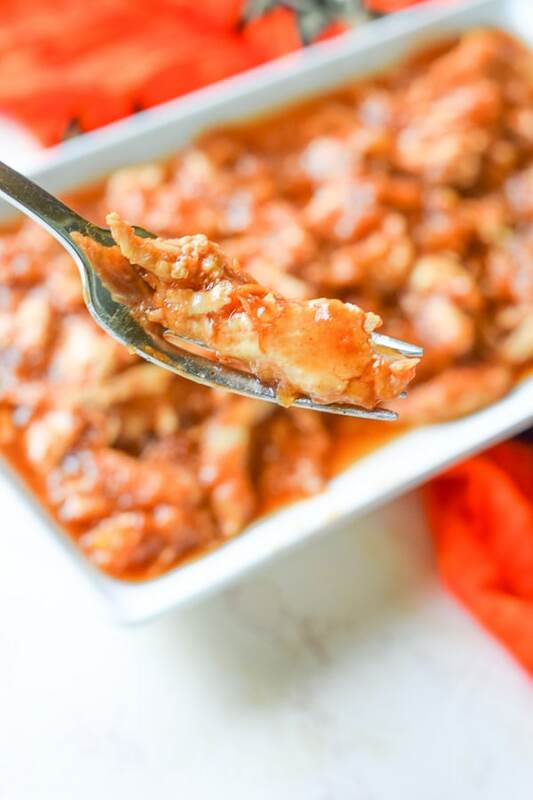 I was attempting to convert my slow cooker Hawaiian chicken recipe into an instant pot Hawaiian chicken recipe. Well, it worked and I’m here to tell the tale. Since I was winging it and trying to use up what I already had on hand, I cut this recipe down from a 5 ingredient recipe to a 3 ingredient recipe. Nobody seemed to notice, or care. This Hawaiian chicken recipe turned out even better in the instant pot. It was sweet, moist, and totally satisfying. We served it over rice for an easy weeknight meal. 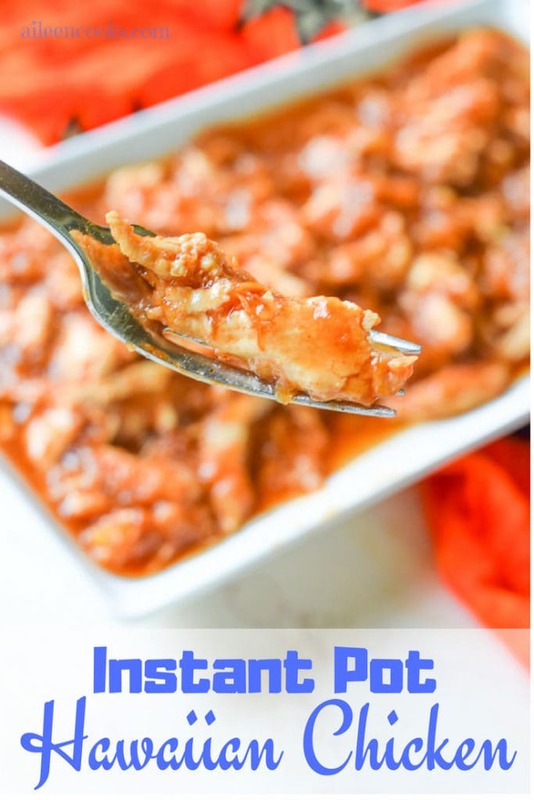 This one has been added to our list of favorite instant pot chicken breast recipes. This instant pot recipe uses just 3 simple ingredients. As I have shared many times, I prefer to start with frozen chicken when making dinner in the instant pot. This isn’t a taste factor, it’s just a convenience factor. I keep a big bag of frozen chicken breast in my freezer and love that I can pull them out without having to defrost them. If you have fresh chicken, just cut the cook time down to 15 minutes high pressure. Either way, you are going to end up with a flavorful chicken dinner. Make this sweet and satisfying Hawaiian chicken in your instant pot electric pressure cooker. This is an easy 3 ingredient recipe that you can just mix together and walk away. Place chicken in the inner pot of your instant pot or other electric pressure cooker. Top with crushed pineapple (juice included) and BBQ sauce. Close lid and set to sealing. For frozen chicken breast: cook on high pressure for 25 minutes. For thawed chicken breast: cook on high pressure for 15 minutes. 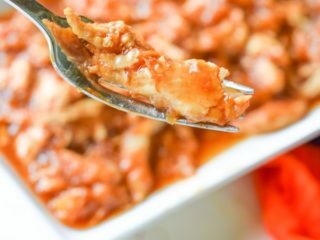 Did you try this recipe for instant pot Hawaiian chicken? Let us know what you thought below with a rating and comment. 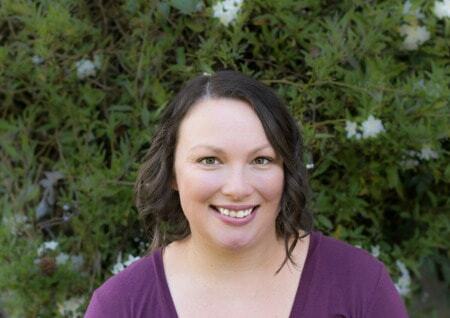 Or tag us in the pictures of your meal using @aileencooks. I really liked this recipe. So simple and get to the table. I had some bell pepper from a friend’s garden. I sliced it in large pieces and added it when the main time was up. I switched to sauté and stirred until the pepper was cooked, but still crisp. Tried it and loved it. i added red, yellow and orange bell peppers that made it a little spicy. It’s something I’ll be making again. That sounds delicious. I’m glad you enjoyed it.